First the Header above is indicating that I am going to clarify would is a candidate for a reverse mortgage and those who is not. Second, please understand, this part of my education is proceeding on the premise that you qualify as a borrower, have an eligible property and the overall structure of the transaction is acceptable. Technically, you are not a candidate if that is not the case, you can click on the image in the box to the left to enlarge and see if you are. Third, the main point I want to make is just because you and your situation quality, eligible and acceptable you may or may not be right for a reverse mortgage, just the same. Below I will address who is a candidate in great detail and quickly rule out those who are not. These homeowners are people of means, "but by no means" have met or fulfilled the definition which by the way equates to "true financial independence," which can be found above in the "Wealthy Homeowner" category. So your eye can easily find it to refer to, because I italicized and underlined it. The use of the word "true" as an adjective is associated with implementation of techniques and strategies to make one more bullet proof or insolated from "life turning on a dime." Generally they fall short in at least one, two or up to three parts of the definition. Often because they did not have time to get there prior to retirement. In other words they did not accumulate enough before they quit working. Of course once too many of these (parts of the definition) are not met (or subsequently eliminated) they simply drop down one category to the "Normal Homeowners" group or tier. (Hello welcome to the club! Not the end of the world). Starting with some of the simpler possible missing parts could be they do not "have enough residual income to save money to continue to build their nest egg" after they pay for their monthly life expenses. This will cause them to eventually enter "The Spend Down Cycle," but sooner. This missing part is very close to not using the proper technique in place which I referred to as the provision for cost of living adjustments to deal with the result and affect of future inflation. The first benefit realized when one closes on a Reverse Mortgage is that they no longer have a mortgage payment in their budget, which can close this gab and correct these two issues. Some have found the extra income or the reduction of overhead from their reverse mortgage can allow them to delay receiving social security benefits. That provides them the benefit of receiving larger and or more meaningful monthly social security benefit when it does start at that delayed and future date. Let me continue these examples, one common one, often is the part about the source of their income is not as I specifically indicated. To be in this group, tier or category, they would need a minuim of $500,000 of liquid portfillo type assets. Which of course is a great block of my money but a far reach from meeting the definition. While their income "from all sources" normally will be adequate to meet all of their monthly obligations, it may "in part" be from gains and profits in the stock market, from a family business they have built, or still from actual employment at a job. The benefit realized for those who are now retired, when your overhead becomes less from no mortgage payment or even monthly checks start coming in, by having a reverse mortgage; is that we can now reallocate the positioning of the (nest egg) capital that is earning us interest to more conservative positions. It is traditional in financial planning to get more conservative when we get to an age and the point when we do not have time to re-earn our nest egg. But in recent times this has not been easy, I see people making this compromise all the time, which is a risk that may be totally eliminated for you with proper planning with less dependence on that source of income. The replacement of that income, as you guessed it comes from either a reduction in overhead from no mortgage payment and possibly receiving checks in the mail because of the reverse mortgage. This resulting shift in asset positioning will help protect you from a major market correction dropping your tier on my matrix here, or even doing a lot more damage that that. Also, this is a good time to insert another financial planning strategy. It is that not being so dependent on the spending of principal in "The Spend Down" period allows this capital to be least liquid or held in longer term opportunities which generally increase total return and yield. 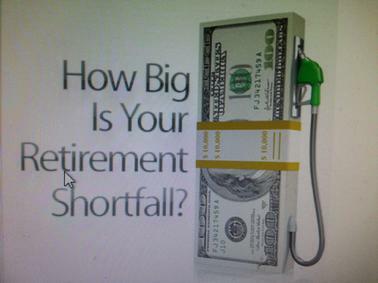 This leads to less equity erosion of our nest egg extending our period of independence financially. We become less dependent on this need for systematic liquidation of our nest egg when we have a reverse mortgage that paid off our 1st mortgage and therefore reduced our overhead or even provided us tax free monthly checks. However, there is a different and additional opportunity for those who are still working who are still generating part of that income in business or from a job, and who have not have not yet had time to build the nest egg up adequately. That is to re-channel, or redirect the monthly funds currently going to the mortgage company to pay your mortgage payment to going into liquid assets which will build that nest egg instead. So in this period rather than build non-liquid house "equity" you now build a more meaningful "equity" positions, in other cash equivalent asset accounts now possible, as a result of having a reverse mortgage. Frankly, everyone in this group, finds that once they enter "The Spend Down Cycle" period, the "with peace of mind" part of my definition starts to become one of the self evident parts that is missing or lost. This is when we start to have to make decisions about when, what and why we select the particular asset we start to spend down. Know that, no matter what, it is painful and disconcerting. By "definition" it is a pain not endured by the homeowners in my "wealthy homeowner" matrix box above because the words, in the definition, "to maintain Capital Retention Planning" is just that luxury. They should not get too complacent, "life can turn on a dime." If or when it does, then they have dropped down to this "Well-Off" group among those who have to choose which asset they need to redeem or liquidate to put in the checking account to spend on monthly expenses. This is as you guessed it called, "Capital Depletion Planning" a systematic long term method of planned bankruptcy over ones lifetime. Those are harsh terms I learned from the life insurance industry. But, the product I offer these days is the instrument that allows you to put yourself in a position to have of the full power of choice of what asset to preserve and what to spend down, when and why. This of course is a Reverse Mortgage. It will allow those who are working still to build their asset base and therefore actually delay "The Spend Down Cycle" starting and for those already in it to select what asset is to be spent down, why, and when. This will allow your assets to last longer when you have more options to choose which to preserve and which to spend down. I will throw out an example of this concept: This is because if you elect to spend house equity during 2014 that you can access tax free that your overall net worth in 2015 will be higher than if you chosen to have spent - down the taxable funds in your IRA rollover. Paying income taxes to access spending money really speeds up the depletion process. The "when" part has to do with not liquating investments during a period when they are depressed do to market conditions or just giving them time to grow when a period of recovery occurs. I would like to say, "like now" but life can turn on a dime, so by the time I typed it and you read it the opposite could be true, so I will not. I always say, "We live in a period where financial advice good for an hour." Warning: Any asset class or any equity account including one's IRA, (as in my example), bank account, mutual fund or stock portfolio and yes of course house equity, that you decide to spend down will drain the equity in that asset. This is not news worthy, however many journalist have written about how a reverse mortgage will eat up your equity and helped to get their short story successfully published. How news worthy would have it been to write about a senior citizen consumer who drew a stream of monthly checks out of their mutual fund account for 14 years which drained all their equity out? Even if they added the fact that now that they drained the account that the mutual fund company did not step in and help them by extending benefits to them by continuing to still pay monthly their expenses. To me they missed the magic of what was truly news worthy. That is when you elect preserve your other assets and to deplete house equity, that even when all the equity has been withdrawn the lender (and FHA insurance) having underwritten that risk will allow you to keep having the benefits of remaining living in your home until you can't remember you have a home! Helpfully that will be a long time. Although some of the situations have been misunderstood the economic benefit of this in some case was essentially equivalent to the senior homeowner withdrawing two or three time the amount of equity they had in the home when they started out. Although all reverse mortgage borrower homeowners pay for the premiums associated with this risk one way or another, it does make part of their resources unlimited. An alternative, to compare to would be to sell your home and then deposit the net equity check in the bank and then systematically start money transfers to the landlord to pay the rent on the place where you will be renting. In that scenario, the rhetorical question is of course, who would step in and underwrite the risk of you running out of money to pay that rent? So even though the "Well-Off" Homeowner does not have the direct need to cope each month for financial survival, a reverse mortgage can be used as part of a strategy to extend the period of financial independence and quality of life. Also, as you have heard the statement, "Money does not bring you happiness", well that is the beginning of understanding my Mom's teachings learned, mostly by my observation. That it is having a great deal to do with one's, "state of mind" which lead to the words, "with peace of mind" that are part of my definition which I have shared. The common theme in all my matrix boxes is we have to maintain that is the goal for me and all my clients. To do that, may take some adjustments. A quote from my dad who was a pilot was "Attitude Controls Altitude" and of course his was talking about airplanes. But in life without "peace of mind" as found in my definition it is hard to have the right "attitude" and that will be a big part of what box you are in on my matrix. Since that is what all leads to your "state of mind" it is key to your level of happiness, not what box you have arrived to. In the box to the left I wrote about the "Wealthy Homeowners" and in that box provided you the definition of true financial independence and the criteria that determines "wealth" by my standards which are from the view point of a financial planner. In the box below that I compared and contrasted it to "Well-Off" Homeowners. The main difference is the "Wealthy Homeowner" ones are meeting 100% of all the parts or components of my definition and the "Well-Off" are failing to meet 2-4 of them. You guessed it the "Normal Homeowners" are missing even more parts or components of my definition. However is one clear part of the criteria of this group or category by my definition is they will all have a more measurable improvement in their standard of living and the quality of life with a Reverse Mortgage than without one. In addition the group of "Normal Homeowners" have less likelihood to have already done all the financial and estate planning then these other two groups. The improved cash flow in their budget from reduced overhead and or receiving monthly checks once the reverse mortgage is in place will allow them to revisit their priorities and take action on subjects. Among other things, this of course could include proper Life Insurance planning to provide the proper needed level in income for a surviving spouse to enjoy living it that house which now has now mortgage payment associated with the reverse mortgage. This 2008 mortgage meltdown lead to many regulators creating new rules to follow requiring documentation of borrower's income to confirm suitablity of programs. Starting in 2015 Reverse Mortgage Loan applications started collecting information to confirm the homeowner has had a track record of paying their property taxes and homeowners insurance timely and will have the modest income requirment to pay such property ownership requirements in the future. Some background and purpose of the classication. Since, I do believe not every one is right for a reverse mortgage I have taken the liberty to quantify who within my financial planning clientele is a candidate for a reverse mortgage and who is not and why. As I share these with you, you will be able to possibly expand your prospective and reflect on how these relate to you and your situation or that of your clients. My objective here or purpose in sharing information about the "Wealthy Homeowners" first has a design to it. I am hope as you understand the characteristics of their profile if they do not apply to yours then that will broaden your awareness of how a reverse mortgage may provide a solution for you or enhance you independence. I will try to convey what my Mom share with me is relevant here. The peace of mind that come to some when they are wealthy being a good part from their state of mind from the perception of the level of financial independence can also be obtained by a lot of us normal homeowners as we enter or prepare for retirement. When I explore other websites about Reverse Mortgages I see a general theme use for credibility; I am sure you have also heard it: “A reverse mortgage is not right for everyone.” I feel this is said, as a basis to start over coming some of the bad press over the years which reverse mortgages have had. My position is not that, ironically that is reverse of how the statement should be stated, and how it is stated through the theme of this website which I have written. The Reverse Mortgage Product is just fine, well defined, tried and true, proven and extremely flexible to be tailor fitted to many borrowers in many situations or scenarios. So here is my official worded statement: “Not every borrower (senior homeowner) is right for the reverse mortgage product.” Then also not every situation or scenario is right for one either, even though the borrower may be right for a reverse mortgage. I have written this page to also help address those situations where that may be the case and will explain how the installation of a reverse mortgage product in those situations led to that bad press and why. So let’s get started, as you have learned the product line I offer is that of Reverse Mortgages. The big question is, “are you right or wrong for a reverse mortgage?” Once you understand the concept it should be an easy answer and I will share that concept and how I came up with it. Back Ground. When I was a child I use to listen to my Mom talk about the financial status of people we knew in the little town my brother and I grew up in. She would use terms like these, Reggie and Connie Bennett are not “weathly” but they are “well off.” I of course started to observe the people who she classified that way and analyzed their lifestyles and that may have been the basis for many of my preconceived notions. One of them that I adopted was she was impressed with self employed people, who she said were “normal” like us financially, but they have developed powerful personalities, with attitudes related to freedom and independence that intrigued her. I am sure that led to me writing this page today. She taught me that "weathly" was a combination of both state of mind and how much money you have. My Dad, used to say things like , the Olson’s have a beautiful home but they are “house poor” and can not even afford to pay their property taxes. When I entered the eight grade, I was or may have been, fortunate to be sent off to a New England Boarding Prep school for the next four or five years. (It may have been a curse as I am still annualizing that). When I was there I made friends from all these groups and would travel for weekend trips once in a while to the homes of the “rich and famous". Although I had a grandmother who was just above the class-tier of “well off” this was my first and only exposure to Chauffer driven Bentleys, mansions, huge yachts and Lear Jets, in spite of all my goal sitting! LOL. My observation was the kids that were from the “well off” families where quick to alert me to that fact. The ones from the east coast old money wealth had no need for me to know that they were, so it was not as easy to know who they were. I learned it mostly when I occasionally visited a few of their homes on the special long travel weekends. I remember being uncomfortable when one of my friends was disrespectful to their butler or maids. I doubt they will be reading my website any time soon. But life can turn on a dime! (So you never know-what goes around comes around so whatch out)! LOl. Then there were the kids from “normal” families like mine who had a Grandmothers pay for their tuition like mine. Later in life at age 38, about 1988 I earned my ChFC (Charted Financial Consultant) designation after my name from the American College and shortly after became branch manager of a securities broker dealer. It was a small shop and had at that time only one broker to manage and that was me, with the spirit of independence instilled by my Mom, and demonstrated by my grandfather, a self made millionair, and that was before the inflation we have had in the last 50 years. I started my career to become a financial planner by entering the Life Insurance Business when I was 25 and then have spent the next 39 years studying these classification tiers if you will, and have clearly defined them and have brought this concept into my work in reverse mortgages. I will share where I have chosen to drawn in the sand as to where “poor” was, where “normal” was, where “well off” was or starts and ends and where “wealthy” started. I develop detail definitions for these groups. I spent much my time helping clients clarify were they were and where they wanted to be by retirement. Once in a while the “wealthy” would throw me a bone, but most of my work was with “normal” clients wanting to become in the top of the “well off” Tier by retirement. We all learned that that would be more challenging that we thought. There are, “Four Tiered Hierarchy of Home Owners” and this may not necessary have everything to do with the appraised value of the property. Based on everything I have learned, in general terms, both, the 1st group or tier at the top of the list of homeowners (poorest will not any longer quality for a Reverse Mortgage) and the 4th group at the bottom (the rich ones) well they are the most complicated and will address in the future but not now), and often are not a good fit for a Reverse Mortgage. There are always mitigating circumstances and I will discuss those. They are mainly associated with the issue of someone changing their classification of the tier they are in and thus trigger a change in their suitability for one. Also there are special situations were certain borrowers and situations are not right for one. #1 - Poor Homeowners (The Poorest are not longer suitable due to FA rules). #2 - Normal Homeowners (Excellent benefits for aging in place and income). #3 - Well-Off Homeowners (Capital presevation of assets & Longevity Risk). #4 - Weathly Homeowners (Philanthropist and Jumbo Proprietary RVM only). I said this 1st group or tier may not be suitable to or for a reverse mortgage because of the new FA rules (Financial Assessment) of borrowers that started in 2015, which can block the poorest homeowners from qualifing. The 4th Group I labeled as the "Wealthly Homeowners" would be talking about a different product than the FHA HECM, since their homes are worth millions. However, I would like a chance to quote on a Jumbo RVM if you have a home like that. These are instruments used for philanthropy akin to wealth replacement Life Insurance policies associated with Charitable Remainder Trusts, for which I currently have no prosective clients. Therefore I am procrastinating writing about the needs of this group. But am taking classes on this subject and developing content for working with the clients of the big league Financial Planner's who are members of The Society of Financial Service Professionals. This is an organization which I have been a member for 31 years. Of course the key to this for many is to understand the thin line of demarcation between the definitions of “the top end of Poor and Normal” and specifically between "Normal" and “Well-Off” and “Wealthy” how and why they exist. This is critical that you understand that the sales people in any field can be subject to bending the suitability guidelines for their industry. This industry is no exception. It is also a relatively young industry and only recently had such suitability guidelines, regulations and professional code of ethics all clearly defined to stop that. My business model and philosophies are not inconsistent with them. I am sure you have noticed this important wording in my caveat disclaimer found in the foot note at the bottom of every page of my website. It is the law that I do that. You will notice this is one of the core themes in the telephone counseling session you will have to go through to obtain your reverse mortgage counseling completion certificate which is a loan condition. You may also be interested that starting in 2015 reverse mortgage applicants will have to document their ability to pay their monthly property taxes and homeowners insurance. This is wise on many levels, including the most import which is to protect certain seniors, ironically from home ownership that is beyond their means. I am sure it is in part seeking an improved public image of the Reverse Mortgage industry. This is by slowing down the unsuitable Reverse Mortgage installations in situtions where the borrower has no ability to meet their loan obligations, to pay for their property taxes and insurance. Again, I said above that it is "wise" and overall will cut down on adding to the list of loans causing negative statistics which has caused a bad "rep" for our industry. Having said that, I personally concerned the new rules will trigger the unintended consequences that many new regulations have caused. Nonetheless they will be enforced and hopefully will not harm anyone inadvertently, as we will try to work through these on a case by case basis. I am referring to the lenders will need to still be needing to foreclose on seniors who refuse to pay the taxes and insurance on their home. Before 2016 many lenders have carried seniors who would or could not pay but in 2016 FHA is forcing lenders to clean up this book of business. The point is the lender are completing needing to enforce property owners paying their taxes and insurance to get into compliance with FHA. So this issue has caused the lender's underwriting guidelines to tighten up to with what I said was FA or "Financial Assessment." So now to quality you have to prove that you have the monthly income to own a property, but do not forget that is a property with no monthly mortgage payment if you are my client with a reverse mortgage. I believe in home ownership, a home of your own with no mortgage payment is a real opportunity. The reason I feel that way is because (unless you have a really valuable home) if you take the dollar amount of your annual property taxes and add the annual homeowners premium, then divide by twelve, the resulting dollar amount you pay on the average, will be less per month than almost every other alternative housing opportunity that you could move to. I am specifically concerned for the small group of borrowers who appear to be in "one" that I labeled the "Poor Homeowners", (now disqualified) as far as not having modest "document-able" income for evidence of meeting this simple loan condition. This is because they could still have other non tradional resources including assistance from family members and staying in their home would still be in the family's best interest. I know it is good for the industry but totally unfair for many people who should have taken action to apply before, back when we could do a reverse mortgage for almost any 62 year old. This was only in the begining of 2015. Since I did not address it specifically above, please do not forget that the senior homeowner must still pay for maintaining the property, repairs etc. So, consideration needs to be give to that issue also.